Though GhostBed already has two mattresses to its name, the GhostBed Flex is the brand’s first hybrid model. With an emphasis on springy support and cooling, this bad boy is a bouncy option that could be perfect for folks who need a little lift while they sleep. But is the bed actually comfortable? To find out, I slept on it myself, assessing its firmness, motion transfer, sinkage, and bounce to determine who would benefit from its unique design… and who definitely wouldn’t. Curious to see whether or not this mattress could be the one for you? Keep reading below! Short on time? Zoom on over to my review summary. 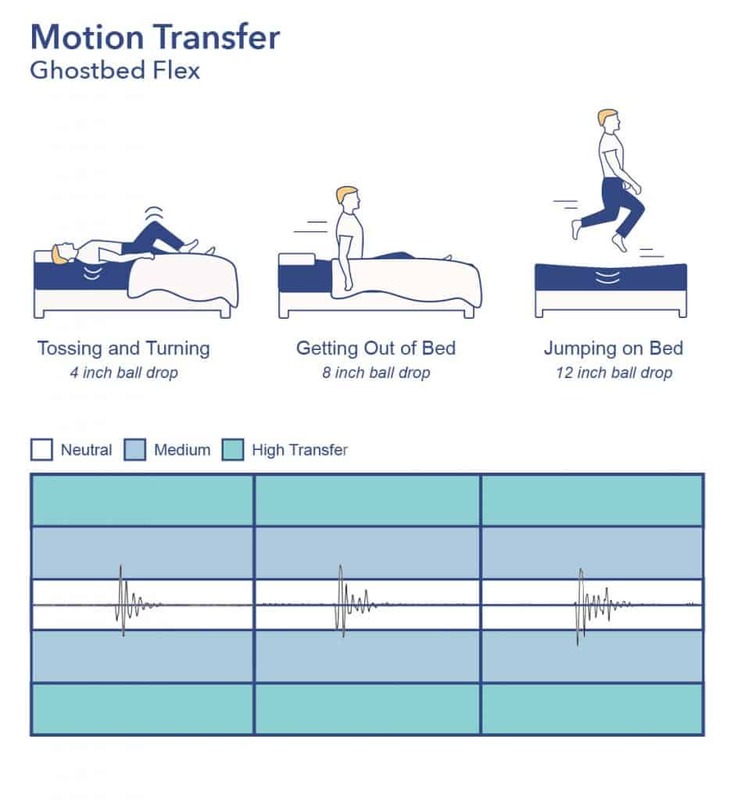 The GhostBed Flex uses a combination of soft memory foam and bouncy coils to provide nice pressure relief with the worry of feeling stuck in the mattress. The GhostBed Flex also uses great materials to help you sleep cool throughout the night! 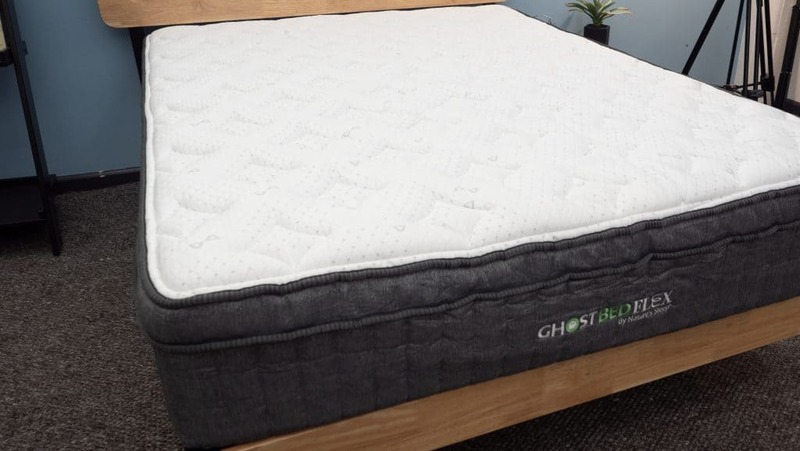 GhostBed launched in 2015 on a mission to provide its customers with “supernatural comfort.” Over the years, this aim has manifested in the all-foam original GhostBed, the luxurious GhostBed Luxe, and a slate of other products (including pillows and an adjustable base). 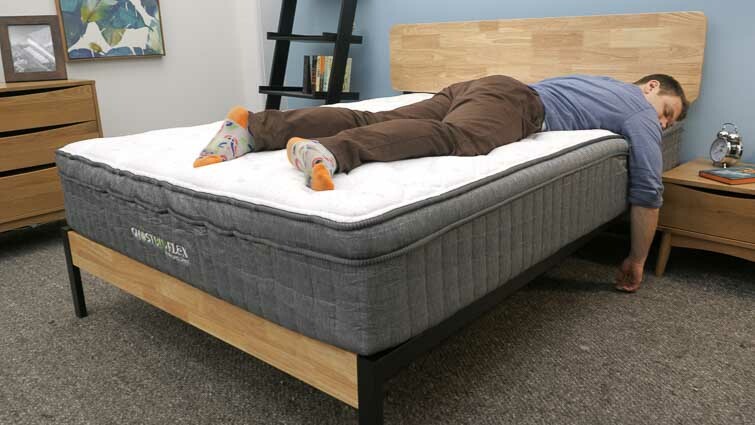 Later on in this review, we’ll compare the Flex to its two GhostBed siblings as well as to one of its biggest competitors on the mattress scene: the Bear Hybrid, another mattress that combines pressure-relieving foams with bouncy coils for an all-encompassing sleep experience. But before we do any of that, we’ve gotta go over the GhostBed Flex’s construction. What is the GhostBed Flex Made Of? With an impressive 13” profile, the GhostBed Flex features layers of cooling gel memory foam and bouncy pocketed coils. The combination of materials is meant to create a taut structure that’ll keep the sleeper positioned on top of the bed while providing them with some satisfying pressure relief. To see how this all comes together, let’s dive into the bed! Cover – The cover is made of a blend of polyester and Phase Change Material, so is breathable, stretchy, and literally cool to the touch. It’s also quilted with an inch of memory foam, which provides the sleeper with some immediate comfort. 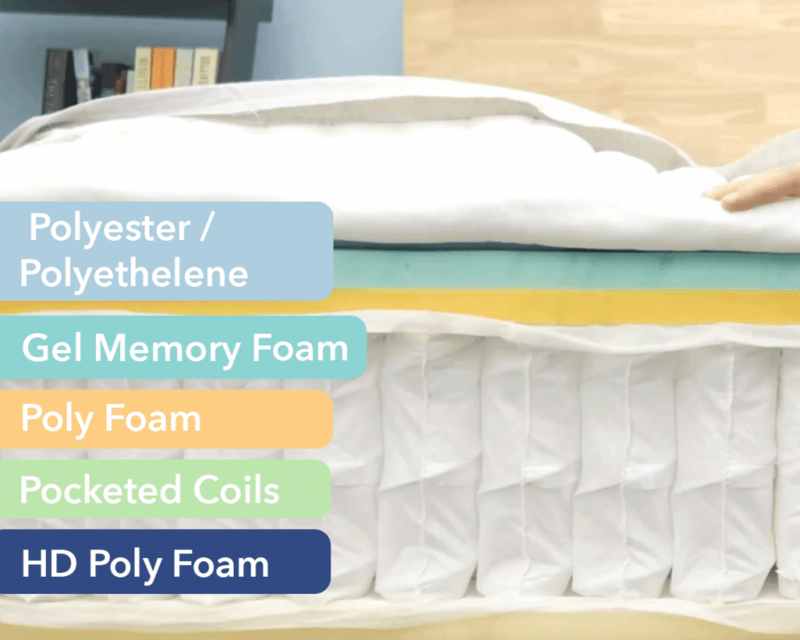 Pillowtop – Below the quilted memory foam, you’ll find a pillow top layer composed of an inch of both gel memory foam and poly foam. This thin layer extends the pressure relief of the cover a little further into the structure, allowing for some sinkage at the shoulders and hips. I should mention that the gel infusion in the memory foam helps to mitigate the material’s overheating properties to keep things cool through the night. Support – The bulk of the mattress is comprised of an 8.5” tall pocketed coil system. This section brings some fantastic bounce to the Flex, which helps to position the sleeper more on top of the structure than in it. While a lot of sleepers may like this extra lift, I think it could be especially beneficial for combo sleepers who need to change positions with ease. Base – And finally, we end with a single inch of high-density poly foam. This section acts as the foundation upon which the pocketed coils can bounce and helps to give the bed its shape. How Firm is the GhostBed Flex? 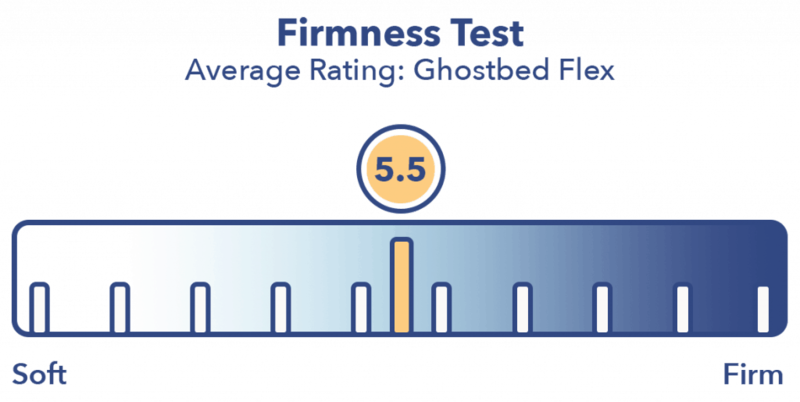 Now that we know what’s going on in the GhostBed Flex, let’s see how it affects the overall feel, starting with firmness. Pressing my hand into the mattress, I was struck by how soft the cover and memory foam pillow top felt under my fingers. I could feel my hand sinking into this layer for some gentle relief, which felt very similar to the comfort I experienced on the all-foam GhostBed models. However, as I pushed in further, I began to interact with the pocketed coils, which responded to my pressure with a healthy amount of bounce. But a firmness test can’t rely on hands alone, so I also hopped on the bed to see how firm it felt across different positions. While I’ll definitely share my own take on the firmness of this mattress, I should mention that I’ll also be incorporating perspectives from three of my coworkers. Why? Because firmness is a subjective measure that can shift depending on body size, weight, and shape. 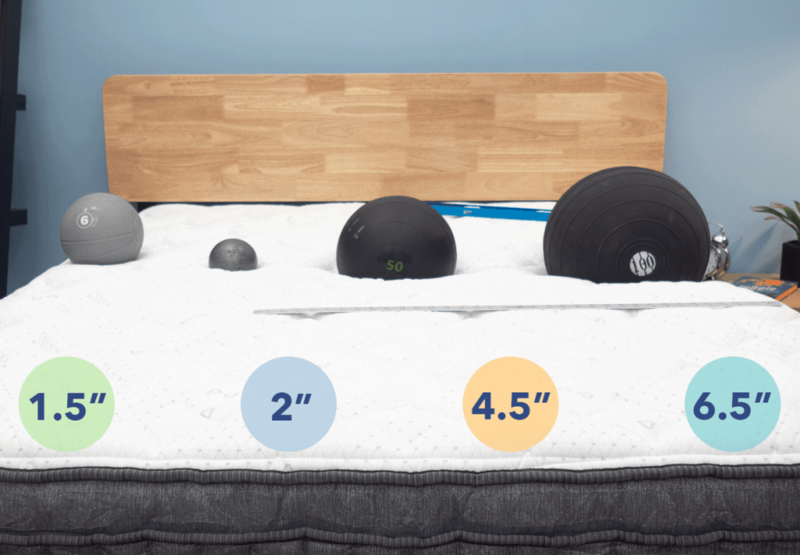 By averaging all of our personal firmness ratings into a single score, you’ll be able to get a more well-rounded read of the Flex’s firmness. Though there was a bit of variance in our responses, we all fell within the 5-6 range, landing on an average firmness rating of 5.5. When compared to the industry standard of 6.5 for medium firmness, it’s clear this bed is quite soft. I personally gave the Flex a 6 as I found it to be just a touch softer than medium firm. Though such a tall pocketed coil system would normally produce a rather firm structure, the coils here are balanced out by gentle foams that help to create a pleasant interplay between the materials. That being said, I think this mattress could be a fantastic fit for those sleepers who switch between their sides and backs, as there’s plenty of pressure relief and support. 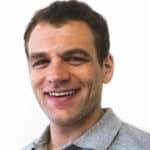 Another important feel factor is pressure, or more specifically how a mattress is going to relieve pressure at sensitive spots along the body (such as the shoulders, hips, and lower back). 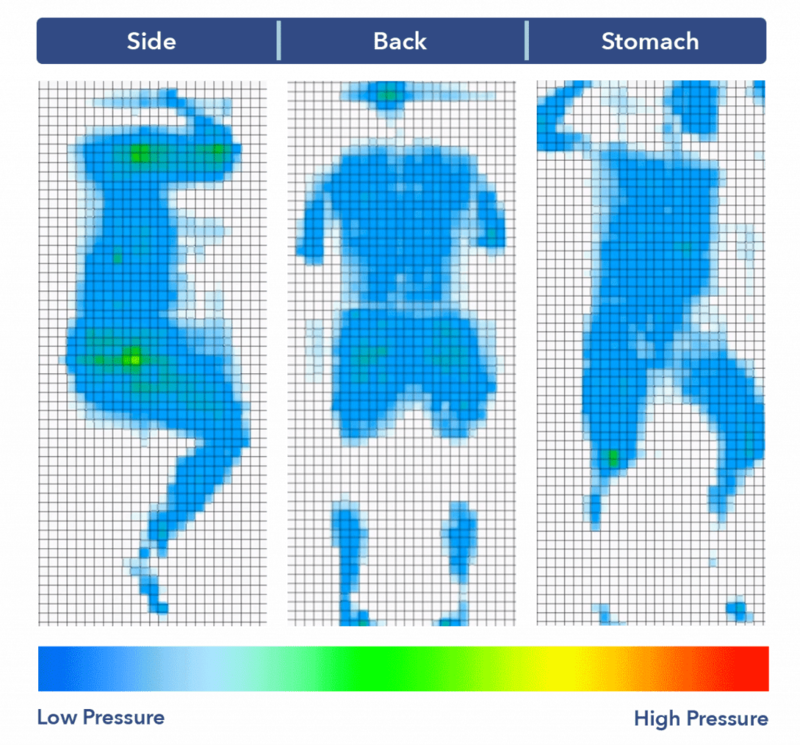 To demonstrate the Flex’s ability to alleviate tension at these spots, I stretched out on a good ol’ fashioned pressure map, which recorded how my body was reacting to the bed in real time. The resultant graphic shows areas of low pressure in blue and areas of high pressure in red. Back – Lying on my back, my weight was pretty evenly distributed across the surface of the mattress. I could feel the top foam layers filling in the space at my lumbar region, which provided some nice pressure relief to this area. Even though I could feel myself sinking into the bed, I’d note that it was easy to move around and change positions. Side – Turning onto my side, I continued to feel some nice relief. My shoulders and hips felt hugged by the memory foam layers, which is something that I see as a big plus for the side sleepers out there. Between the nice pressure relief and good bounce of the GhostBed Flex I think it could be great for those who switch between side and another position throughout the night. Stomach – On my stomach, I didn’t feel super comfortable. The softness of the structure caused my hips to sink out of line with my shoulders, which created some discomfort along my spine. 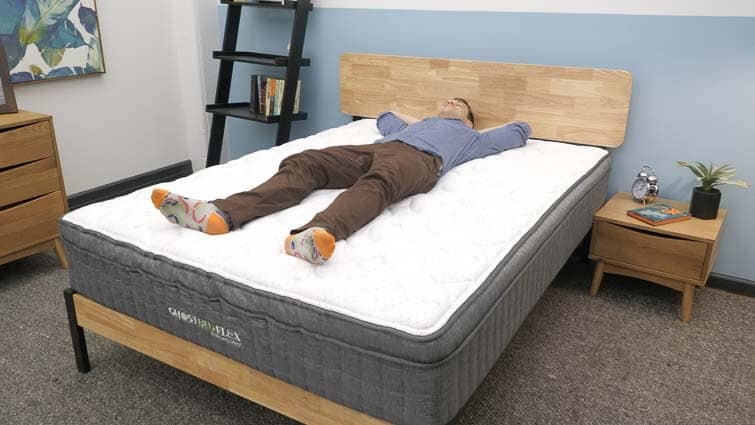 Stomach sleepers tend to go for firmer mattresses that support a healthier spinal alignment, so I’m not sure I’d recommend this bed for those folks. Check out my guide to the best mattresses for stomach sleepers! 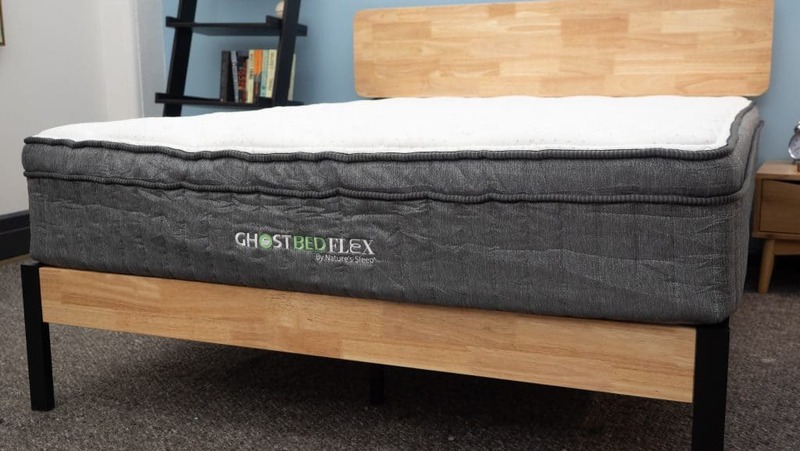 To liven up this review, I’m going to take a moment to compare the GhostBed Flex to one of its biggest competitors in the space, the Bear Hybrid. While both beds are unique products in their own rights, they do share some striking similarities and differences, which I’ll break down below. Like the GhostBed Flex, the Bear Hybrid is a bed-in-a-box hybrid built with layers of foam and pocketed coils. However, it features latex over memory foam, so has a medium firm to firm feel (as opposed to the Flex’s relatively soft one). The Bear Hybrid also has great mobility, but doesn’t have the intense bounce that the Flex does. Pricewise, these two beds are competitively priced, with the Bear coming in at $1,200 for a Queen and the GhostBed coming in at $1,300. For more on the Bear Hybrid, check out my full review. While we’re here, we might as well also compare the Flex to its GhostBed siblings: the Original and the Luxe. Though the three beds do share some attributes (gentle foam, emphasis on cooling), I consider them to be pretty distinct products in the space. Unlike the Flex, the Original GhostBed is built entirely of foam (including latex, memory foam, and high-density poly foam). The mattress, then, has a fairly balanced feel of mobility and pressure relief, though doesn’t have the bounce of the Flex. Notably, the Original is less expensive than the Flex, coming it at $900 for a Queen. 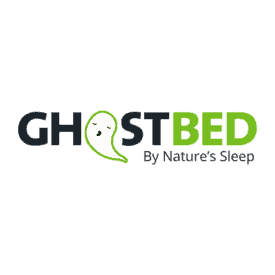 For more, take a peek at my full GhostBed review. As the name implies, this mattress is the brand’s luxury model, so features plush foam layers for sinkage and body-contouring. This produces a very different feel from the Flex; however, both beds do share similar cooling attributes. They’re also similarly priced, though the Luxe edges out over the Flex by $100 at $1,400 for a Queen. Wanna learn more? 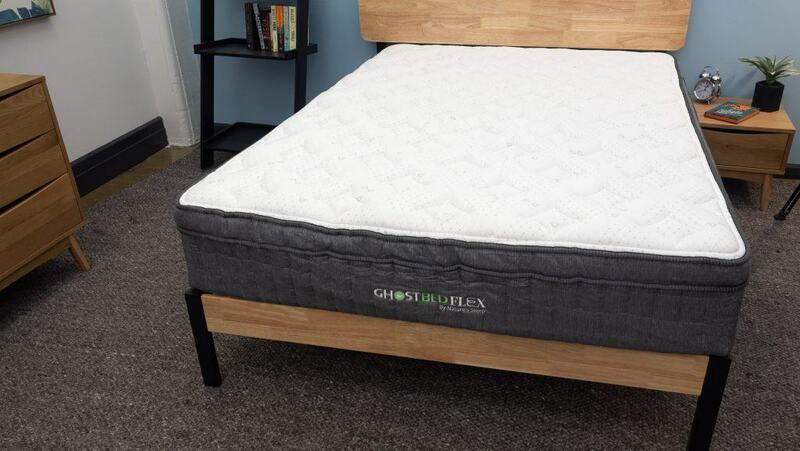 Read my full GhostBed Luxe review. You can also check out my GhostBed comparison for an even more extensive breakdown. Alright, back to the GhostBed Flex! In this next test, we’re going to figure out the bed’s motion transfer, or the amount of movement detectable from one side of the mattress to the other. An important factor for all sleepers, but perhaps especially so for those who share a bed with a partner or a rowdy pet. These are pretty decent motion transfer results, especially considering how bouncy pocketed coils tend to be! The memory foam layers are the real superstars here, working to absorb and dampen movement before it can make too much of a scene. That being said, I’m inclined to recommend this bed to couples who want a hybrid mattress, but are easily bothered by nighttime movements. How Far Will You Sink Into The GhostBed Flex? My final test is all about sinkage, the component of a bed’s feel that determines whether you’ll feel more “on top” of the mattress or “in” it. These are pretty dramatic sinkage results, especially for a hybrid mattress. While you’re very likely to sink into the plush top layers of foam, the bounce of the coils should lift you up and out of the structure for more mobility than you’d get on something like an all-foam bed. It’s an interesting mix of sinkage and support that could really work for combo sleepers with a preference for side-sleeping. Is the GhostBed Flex Mattress Right for You? The question of the hour: Is the GhostBed Flex Mattress the absolute perfect bed for you? It’s something I can’t answer (I am, after all, not you), but I can provide you with a few final thoughts to help guide you toward your final decision. As I mentioned a few times in this review, I really like this bed for back/side combo sleepers. The mix of pressure relief and mobility could be great for people who switch between these positions. I also enjoy the fact that it sleeps cool, a great plus for sleepers who tend to overheat in the night. Additionally, it could make a nice bed for couples, as it performed well on my motion transfer test. This is a soft bed, so isn’t going to be a slam dunk for stomach sleepers, who tend toward firmer structures for even spinal alignment. It’s also not quite supportive enough for heavier folks, who are likely to sink right through its layers.